Company is on an $80M+ Revenue Run Rate by Fixing a Broken Talent Marketplace Model with a Service that Pre-screens and Custom Matches Proven Engineers to a Client’s Team and Project. SAN FRANCISCO – April 30, 2015 – Toptal, the network for elite freelance software engineers, announced today that it is delivering the top three percent of developers worldwide to help companies address the shortage of local talent they need to innovate and compete. The company is the first to rigorously screen applicants and custom match its engineers according to each client’s unique project and team requirements. By thoroughly vetting the quality of its talent network, Toptal is able to confidently offer a 100 percent risk-free trial period for each new engagement. This has enabled it to gain considerable traction with companies in segments such as financial services, aerospace, consulting and high tech. Toptal’s approach contrasts sharply with open talent marketplaces such as oDesk and Elance that often leave companies dealing with hundreds of project bids and applicants with no guarantee of quality or team fit. Its unique model gives companies the freedom to rapidly build or augment project teams without the risks of making a bad hire. According to the U.S. Department of Labor, the unemployment rate of software engineers is just 2.6 percent, less than half the rate of 5.5 percent, the number considered by many to be full employment. As a result of this drastic shortage of talented engineers, companies in the United States and other developed economies face fierce competition when hiring for their most important projects. According to a 2012 McKinsey study, large software projects run, on average, 66 percent over budget and 33 percent over schedule. Of note, the inability to secure critical internal and external talent is associated with nearly half of all cost overruns. Toptal has built a thriving, global community of senior engineers by focusing on the best. There are ‘Toptalers’ from MIT, CERN and Google, as well as Top 100 Rails contributors, Django committers, authors and professors. Employing a rigorous screening process where senior Toptal engineers assess every new applicant, the company vets language and personality, computer science fundamentals, advanced technical knowledge, and the ability to thrive as a member of the Toptal network. On average, the company accepts only three percent from the thousands of applications it sees each month, making the Toptal community more selective than Harvard University or the U.S. Navy Seals. For Toptal developers, the service is compelling since it allows them to choose from challenging projects at leading companies, set their own schedules while working from any location, and be compensated competitively for the value they provide. The result is an exclusive, tightly-knit community of developers with a unique lifestyle embracing the freedom and flexibility of working remotely as trusted professionals. Two important elements highlight the nature of the relationship that Toptal has with its clients. With an average engagement size of approximately $40,000, Toptal projects are more than 10 times the size of many competitors. Also of note, open talent marketplaces serve a large range of projects, including simple websites or hobby projects; Toptal focuses on clients with serious, intriguing engagements. By also vetting clients, Toptal strives to ensure that every engagement between a Toptal client and a Toptal engineer will be a meaningful success. In 2014, Toptal achieved 189 percent revenue growth, and is on an $80 million plus run rate for 2015. Currently, Toptal’s network comprises thousands of developers and more than 2,000 clients. The company has enjoyed success in the SMB market and is seeing increased traction in the enterprise segment. Large Toptal clients include J.P. Morgan, Axel Springer, IDEO, Pfizer and Rand McNally. It has also worked with high-growth companies such as Airbnb, Artsy, FundedByMe and Zendesk. The company’s current investors include Andreessen Horowitz, Adam D’Angelo of Quora, Dave Hersh of Jive and Ryan Rockefeller. 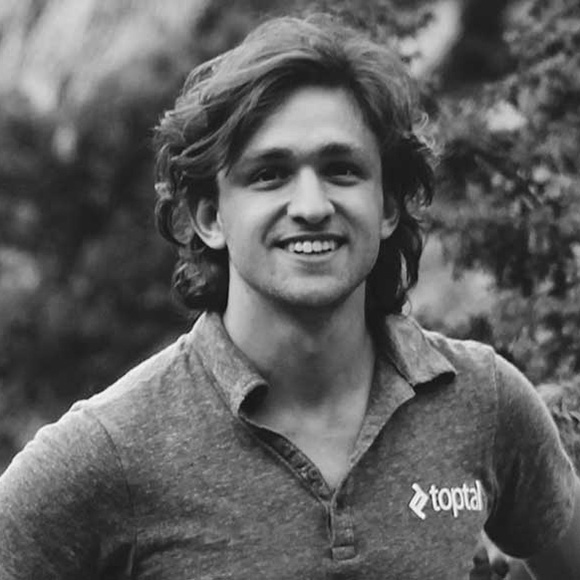 Toptal is one of the most innovative and rapidly expanding tech start-ups from Silicon Valley. With backing from Andreessen Horowitz and Adam D’Angelo, its platform is the fastest growing labor marketplace in the history of the Internet – connecting thousands of elite engineers all over the world. In the last four years, Toptal has become the #1 choice for tech companies requiring top-tier engineering talent and for the top 3% of freelancers looking for their next challenge.